What do the deaths of 12-year-old African-American Gilmore Johnson and 15-year-old Lithuanian-American Joseph Donner, both of Springfield, tell us about crime and punishment during The Great Depression? I was surprised to learn that even petty property crime by youths back then was often met with fatal gunfire, both by police and by family business owners. This no doubt speaks to the high frequency—and the high stakes–of property crime as families struggled to survive the greatest economic calamity in American history, at the same time that local coal mines were conducting mass layoffs and the Progressive Miners of America (PMA) were on strike. The nature of crime and punishment during those trying years of wholesale unemployment and bread lines definitely seemed to pit struggling families against each other–just as the Mine Wars pitted the United Mine Workers against the Progressives. I say that because the taverns and groceries being targeted for break-ins–and occasionally, armed robbery–were owned and defended by working families living on the premises. And, the policemen shooting to halt, maim or kill were often laid-off miners distinguished from the perpetrators they were shooting at mainly by the luck of having secured their jobs on the force. The fact that men on both sides of the Mine Wars, as well as child burglars and the family business owners they targeted, pretty universally seemed to own or to be able to steal firearms underscores the fact that our seemingly crime-ridden times may not be unique. Joseph Donner, Jr. of N. 19th St. was born on May 8, 1917 in Piston, Pennsylvania to coal-mining father Joseph Donner, Sr. and mother Anna Zacarosky Donner, both born in Lithuania. Only a few months after I learned of this young man’s death, I stumbled upon his graduation photo from Ridgely School at the age of 15 in 1932. 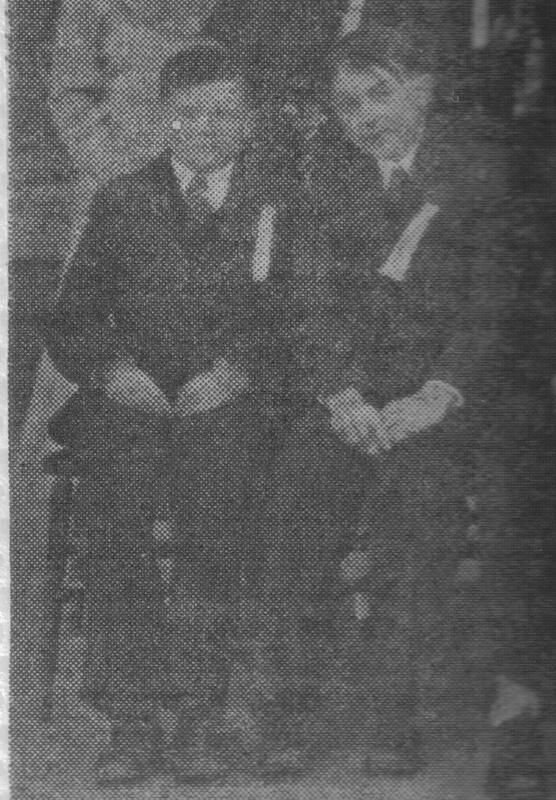 From left: Joseph Donner with friend John Shaudis at their Ridgely Grade School graduation, 1932. According to the Illinois State Journal, Joe apparently began participating in a string of petty burglaries and larcenies starting two months after his grade school graduation, on July 4, 1932, when he entered the Woodland Ave. home of Walter Hanson with an older boy, Joseph Orback, 17. Orback was the son of the late Frank Orback and Anna (Baksyte) Orback, my father’s paternal aunt. On Dec. 1, 1932, according to the newspaper, Orback, Donner, Charles Jedrosky, 17, and George Sotak, 17, all–except Donner, of N. 17th St.–and likely all Lithuanian-Americans, broke into the Voyzel lunchroom on R.R. 8, taking a small quantity of tobacco and candy to sell. Then Orback, Jedrosky and Donner, minus Sotak, broke into the Frank Mason Grocery at Walnut & Calhoun Ave., where they were ambushed by police. Young Donner was shot in the back and the side when he ran away instead of obeying the order to halt. While initial reports indicated he was improving, poor Joe died of his wounds at St. John’s Hospital on Dec. 3, and was buried at Calvary on Dec. 6. A State Journal article dated Dec. 1, 1932, states that Patrolmen John Rooney and William Cellini, and Detectives Edward Hagan and Samuel Phoenix, were the police who had fired the shots. The coroner’s inquest did not determine which officer fired the shots that hit and killed young Donner. According to Bill Cellini, Jr., grandson of Patrolman William Cellini, “Sam Phoenix (1903-73) was one of the few African-Americans on the force at that time. He must have joined at the same time as my grandfather, because on the 1930 census, Sam is listed as a coal miner at 520 North 12th. Then by 1931, he’s on the force. It’s remarkable that he got to be a detective in the short span from 1931-32.” Edward Hagan, despite his Irish-sounding name, was another African-American detective. Patrolman John Rooney was from England, and the 1930 census shows he immigrated to the U.S. in 1910. Probable ringleader Joe Orback went on to violate the probation he was granted for the 1932 break-ins and was sent to Menard for two years in 1933. This seems to have launched him into a life of crime, since the 1940 Census finds him in prison at Marion. I sometimes wonder if young Donner might not have ended as he did if it hadn’t been the Depression, and he hadn’t taken up with the wrong older boys. Gilmore Johnson, 12, of N. 14th St. was breaking through the window of a side door at Lapinski’s Tavern at 11th and Washington at 5:50 a.m. Dec. 20, 1937, while his 13-year-old accomplice Griffin Clark kept watch–when Lithuanian immigrant owner Simon (Sam, Sr.) Lapinski, who slept upstairs, was awakened by the noise and grabbed his gun. After Lapinski shouted at the boy, he took off south down 11th Street. Lapinski ran into the street and fired three shots in warning, while ordering Johnson (never having seen Clark) to halt, and then fired a fourth shot that he said he DID intend to hit the fleeing burglar—whom in the darkness, he didn’t know was just a boy. Young Gilmore was fatally wounded. An unloaded .38 caliber pistol and a watch were found on him, taken from the Starlight Tavern at 1230 E. Washington, which the boys had previously broken into. The newspaper reported the two boys also had broken into the Edward McCann tavern at 917 E. Washington and the Leon Stuart filling station at 14th and Jefferson, and had been apprehended three times before and released, due to their youth. This time the surviving boy was turned over to juvenile authorities. An “all-colored” coroner’s jury unanimously recommended that Sam Lapinski be turned over to a grand jury, and he was held for investigation by a grand jury, but I could find no further articles about what happened next. Sam, Sr. was active at St. Vincent de Paul Lithuanian Catholic Church and its chapter of the Knights of Lithuania. His son Sam, Jr., a former miner, had recently joined the Springfield police force and later took over Lapinski’s tavern. My thanks to Bill Cellini, Jr. and Tom Mann, a retired Springfield police officer and genealogy researcher, for their assistance with this post. Wow, amazing research! Great story! operated the Fairview Tavern on north 16th.